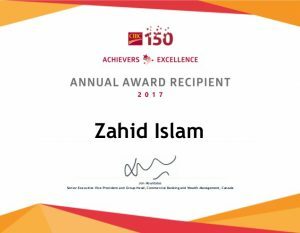 MFAc 2012 graduate Zahid Islam has been awarded as Annual Achiever Award in CIBC commercial banking 2017. CIBC Annual Achiever is individual who has made exceptional contributions to enhancing and deepening client relationships at CIBC. A role model for excellence, commitment, and living the values of trust, teamwork and accountability. This is Annual distinguished honour – the highest level of recognition. 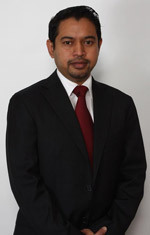 Zahid is currently working as Senior Manager & Team Leader in CIBC Commercial Banking, Central Interior & Northern BC. 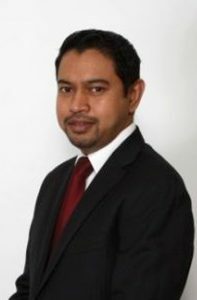 MFAc 2012 graduate Zahid Islam has been awarded as a Top Performer in Scotiabank commercial banking 2014, in the Best of the Best Program. 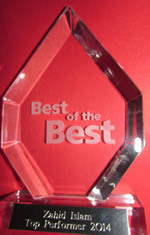 Best of the Best Award is a prestigious employee award in Scotiabank. Awarded to the employees for an exemplary performance, a passion for work and commitment to their customers, the awardees form the hallmark of Scotiabank's Applause program. The MFAc degree from York has equipped me to face any professional challenges and successfully start a career as a Client Relationship Manager in Commercial Banking in Scotiabank. As a new immigrant MFAc was my first Canadian education. The skills gained in this program has helped me a great deal to mitigate risk, reduce expenses, and provide solutions to the commercial clients' financial needs. This stellar performance has earned me the Top Performance Award 2014 in Scotiabank Commercial Banking. I attribute this success to the MFAc program and all the members of MFAc family.